Father Carlos Hamel of the Fraternity of Saint Joseph the Guardian will preach a retreat based on the Ignatian Exercises, at the Church of Saint John the Baptist, 1282 Yardville-Allentown Road, Allentown, N. J. The Spiritual Exercises comprise an ordered series of meditations and contemplations born from the profound spiritual experience St Ignatius, gained from his conversion and his time as the first Superior General of the Society of Jesus. These exercises purpose to help the retreatant discern God’s will for his own life. The retreat will begin on the early afternoon of Friday, February 19 and finish on the afternoon of Sunday February 21. 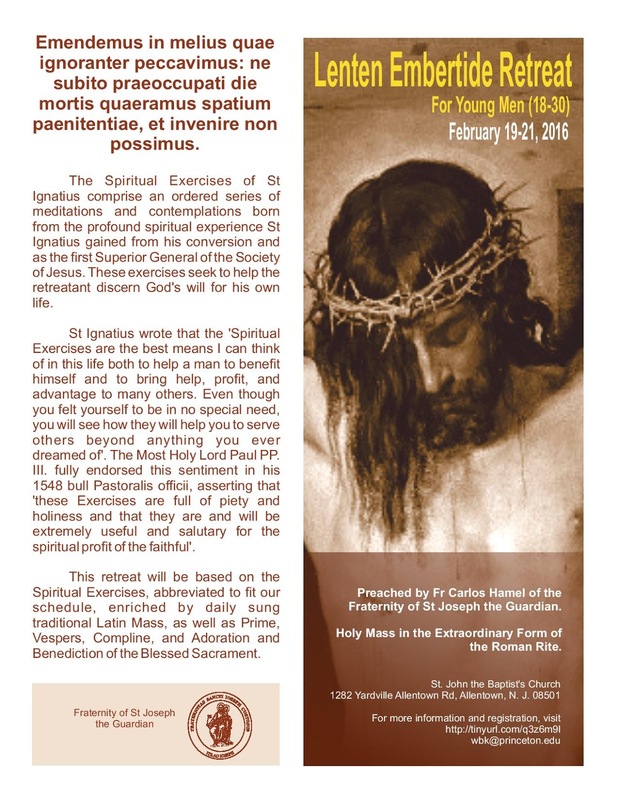 The cost of the retreat to cover the expenses (Fr. Carlos’ travel from France, food, donation to the parish, etc) is $60. Also, please bring a sleeping bag. In addition to the meditations, the traditional Mass will be each day, as well as parts of the Divine Office; there will also be plenty of opportunities for spiritual direction and Confession. To confirm your attendance, or if you have any questions, please e-mail Wynne Kerridge at wbk@princeton.edu. See the Facebook page for the event here. Feel free to forward this invitation to any else you reckon would be interested.